Admito que vestir padrões fora do registo preto e branco é sair um bocadinho da minha zona de conforto. Principalmente se forem padrões florais. Não é algo que haja em grande quantidade no meu closet porque para mim não é um padrão fácil de vestir pronto. Sou esquisita. Mas estamos no Verão e cada vez que entro em lojas sou bombardeada por padrões florais por todo o lado e, por isso, coloquei a minha zona de conforto um bocadinho de lado e experimentei. (É que cada vez que vou, por exemplo à Zara, refugio-me na zona da roupa preta e branca e não me apetece sair de lá). Bom, a verdade é que gostei muito de como ficam estes calções. É uma peça que marca, leve e alegre para esta altura. E com este calor que está por Lisboa quem aguenta andar de calças? Eu não de certeza! Espero que gostem! I have to admit that wearing prints outside of black and white it's leaving my comfort zone in a big way, specially if those prints are floral. It's not something that I have a lot in my closet, because, for me it's not an easy print to wear. That's it. I'm so picky. But we're in the summer, and everytime I go into some store I'm overwhelmed by floral prints everywhere, so I tried these shorts. And the fact is that I really like how they look. It's a statement piece, light and fun for this time of the year. And it's so hot in Lisbon that I can't even think of wearing pants! I hope you like it! Loveee those floral shorts! Looks perfect with that red purse. I absolutely love floral prints; I wear them all year round! Those shorts are so pretty even if they are out of your comfort zone...and I love the sandals! Such a beautiful summer look! Those gladiators are amazing! you can definitely step out of your comfort zone a lot more because this more colorful print looks brilliant on you. Amazing look! Love the shorts! Wow, honey, what an amazing look! The shorts are so pretty! Ola Adriana adorei o look, essa estampa floral ficou muito bem em você e as fotos ficaram lindas!! love the print of your short pants. These shorts are so summery! I love the length and print. I am completely obsessed with these shorts! They are too cute! Love your floral shorts and how elegant you styled them! SOO in love with this outfit, those floral shorts are way too gorgeous and such a perfect summer look. How cute are those shorts!! I love the red bag you've paired it with, so cute! Este outfit é super fresco! Gosto dos calções! Perfecta! los shorts son preciosos con ese estampado floral y las sandalias me gustan muchísimo, tengo unas muy parecidas. Okay, I need to be wearing this right now. You look so amazing! I love the pattern of your shorts. Those sandals are summer perfection. Seriously such a great look! Thank you so much Amy! I'm glad you like it! OH perfect summer outfit, so inspiring! O seu blog é estiloso, tem uma apresentação linda e é cheio de informação útil. Que você tenha uma ótima segunda feira!!!! You look amazing! Loving the floral shorts with the gladiator sandals! Floral time? More like beauty time. You are stunning in this look. Thank you so much dear Rachel! Fizeste bem em sair do teu registo, ficam-te lindamente os calções. E a carteira é giríssima. I usually feel the same as you and I must try to leave my comfort zone! Adorei! Estavas muito gira :) Gosto sempre da tua maquilhagem. Padrões e cores é sair da minha zona de conforto, mas fizeste tão bem, estás maravilhosa! Os calções são lindos, adoro! Também saí um bocado da zona de conforto, embora já tenha investido em vestidos e saias floreadas mas mais 'soft', quanto aos calções confesso que os comprei a medo, mas adorei, vestem lindamente. Sabes que eu nunca vou aos saldos mesmo às lojas físicas? É mesmo só online. Não me dou muito bem com toda a confusão das lojas nesta altura e ao menos online vejo mesmo tudo o que há. És como eu, também vestir padroes para mim e sair um bocado do meu estilo, mas é sempre bom! Gostei do look :) fica-te bem! Love the look, your mini michael kors is perfect! Love this look! Glad you ventured out of your comfort zone because you created the perfect summer outfit. :) I love how perfectly the shorts go with your purse. Absolutely gorgeous look! I love the floral print shorts and the bright colors are so fabulous! So pretty! Love this from head to toe and your hair looks incredible! Os calções são tão giros!! adorei o look!! I'm in love with the print of the shorts! os calções são lindos, também adoro preto e cores mais neutras, mas adoro peças florais confesso, não lhes resisto! You don't know how to style them?! Girl, you look PERFECT! You've styled the floral piece so well, and I'm in love with your shoe choice! Love love love! Those shorts look so cute on you and look perfect with that bag! wow love your photos and this outfit. so gorgeous! I love floral prints! Totally agreed that it is not so easy to wear! You are looking great in that floral prints! I am a big fan of black and white too but if I want to lighten up my day, I will go for some bold colors or prints! ;) I love your style very much! I love this amazing look. Yo amo los estampados floreados, son realmente hermosos y hasta versátiles según queramos. Te luce muy bien este look. Si gustas puedes pasar. Saludos! Wow darling! Cute look! I totally love this floral print!! Amazing floral shorts!! Love it! It´s a bit hard for me too to wear prints, but I must admit that I love it when I do. This outfit is already one of my fav. Adoro este look , tudinho! Quero essas sandálias já, são tão lindas..
Adoooro tudo!! As sandálias já pensei em comprar também mas depois achei que se calhar os cordões que atam à pena acabavam por descair com o andar, acontece-te isso? I need those shorts and that bag! I am obsessed! perfect ! love the total look ! That skirt looks amazing on you! That floral print is to die for. those shorts are super cute! I want one, and don't forget the purse and the gladiators I'm in love with your outfit. I blog about jewelry and how to style jewelry with outfits, tell me what you think. Love those bright colors on you! They suit you well! Gorgeous babe! Ai que look lindo e esse óculos meu Deus, tá muio divo. You look so bright and happy in these photos and those shorts! Always stunning. I love your sunglasses and shade of lipstick. Both give your outfit more flare. Thanks for sharing and feel free to visit the hottest eyewear blog in the world. Look muito giro e fresco para esta altura do ano! wow, this shorts are so pretty! Pretty! Love the floral shorts and the sandals! That is one of the prettiest floral patterns I have seen to date! Even more cute that it's on a pair of shorts - and styled perfectly by the way! These pants are so fun! Have a great Monday gem! Love the vibrant colors in your outfit! You look cute in those shorts! 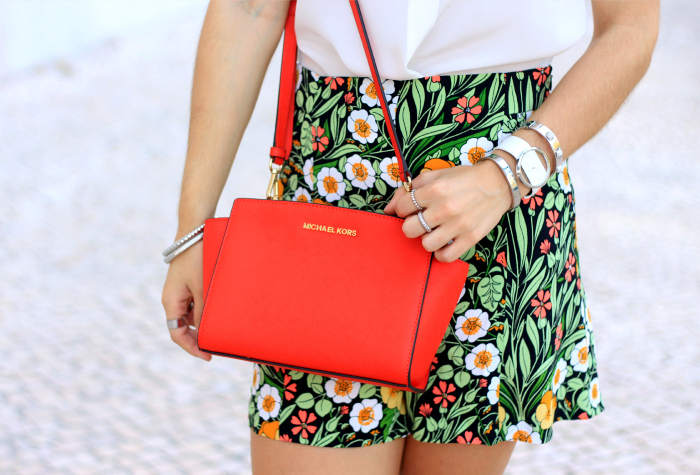 Good match with the Michael Kors bag!